The basic idea is that while R is great for statistics, its graphics engine does not support dynamic and interactive graphics such as those created using D3. Additionally, while D3 is great for dynamic and interactive graphics, we have to get statistical information from elsewhere to visualise anything more than the most basic of statistical models. To get the best of both approaches, I further developed the gridSVG package to be a bridge between the graphics provided by R and the interactivity and animation provided by a web browser. loess (or loessShiny, the effect is the same) on slide 34. 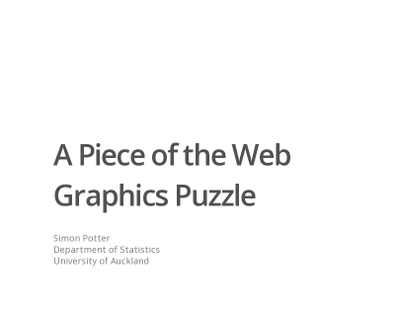 Much of the content demonstrated in my Masters Thesis displays animated and interactive content that are not adequately captured in printed form. Furthermore, many of the examples also demonstrate the use of R as a web server, which is central to the core idea of my thesis. There are further packages that require installation that are not (yet) available on CRAN. These packages are animaker and the companion package to my thesis sjpMScThesis. These are available in the Downloads section below. Hexagonal binning — A comparison of encoding the density of data in a plot by area or colour. ARIMA Diagnostics — Interactive ARIMA model diagnostics. ACF and PACF plots dynamically update in response to changes in any of the p, d or q parameters in an ARIMA model. LOESS Smoothing — A simple example which easily enables a user to determine a suitable value for controlling the degree of smoothing applied. Multidimensional Scaling — An interactive example showing the effect of multidimensional scaling on the true pairwise distances between european cities. Sampling Variation Teaching Example — A reimplementation of the sampling variation animation that is created by the Visual Inference Tools package. Key improvements are that animation timing is accurate and the animations themselves are smooth. animaker is developed on GitHub and is not (yet) available on CRAN. The following links are simply builds from the latest revision of the GitHub repository. The sjpMScThesis package is developed on GitHub . The following links, like animaker, are builds from the latest revision of the GitHub repository. Each of the examples in the sjpMScThesis package are designed not only to be easy to use, but also to be easily modified or examined. If you inspect the examples folder where the package was installed, you will find each of the examples. They should all run outside of the package with minimal modification (only relating to source() usage and Rook port selection). To stop an example, simply call stopThesisExample(). For a list of the available examples, see listThesisExamples(). Examples can be configured using the getExampleOptions() and setExampleOptions() functions. Consult the sjpMScThesis package documentation via ?setExampleOptions for more information.